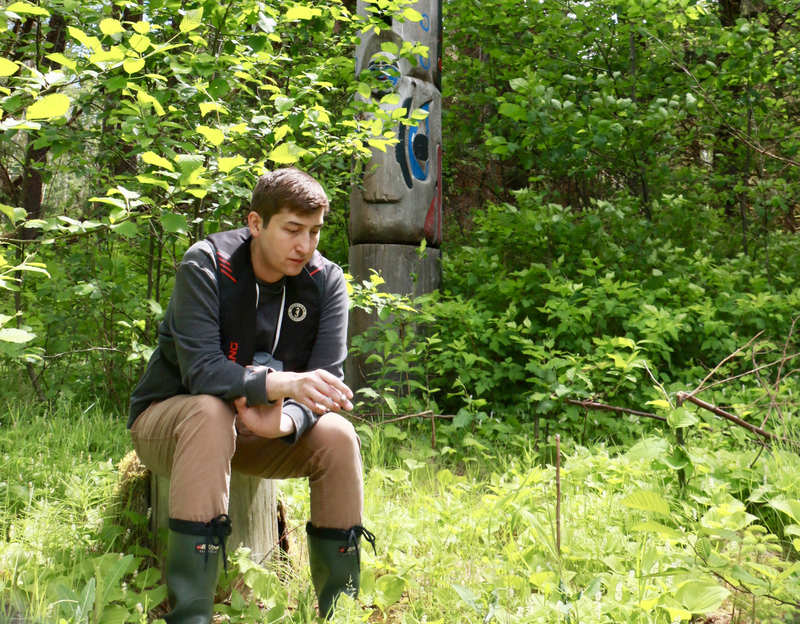 On a May morning in British Columbia’s Bella Coola Valley, Clyde Tallio, a long-limbed 31-year-old Nuxalk intellectual, and I walk a dirt road that gives way to a forest path up a bank from Thorsen Creek, swollen with spring melt. As we slip beneath the forest canopy, we move between worlds: from rural Western Canada to sacred Nuxalk territory—the lands of Tallio’s people, who are emerging as the protagonists in an Indigenous epic unfolding on this unconquered expanse of Pacific coast. Tallio calls out in his Nuxalk tongue, an endangered language with fewer than 10 fluent speakers that he spent years studying instead of attending university. He announces our presence to the animals, ancestors and spirits, clearing the path and asking for protection. We turn our bodies in a clockwise circle, the same way dancers spin before entering the dance floors of the big houses that are the spiritual heart of Indigenous communities along the coast. Thorsen Creek, or Squmalh in Nuxalk, a tributary of the lower Bella Coola River cut into the valley by retreating Pleistocene glaciers, connects us to Nuxalk creation. Ahead, watching us from the soggy floor of the verdant rainforest, are dozens of ancient petroglyphs etched into rocks lining the stepped trail. The glyphs, carved in stone thousands of years ago (estimates range from 5,000 to 10,000 years), date roughly to the Mid-Holocene, a period of significant ecological change that made resources like western red cedar — an essential material for building structures, wares and artworks — more abundant and accessible to coastal peoples. Tallio dates the glyphs to “the time of the fixing of the Earth.” In poetic, if not archaeological terms, he might be right. The Nuxalk followed and enforced these ancient decrees in every aspect of their social life, from summer fisheries to winter ceremonies. The explorer Alexander Mackenzie learned just how serious the Nuxalk were about their laws when he travelled the Bella Coola River in 1793. Admiring a large fishing weir, Mackenzie asked for a closer look but was refused as a visitor unpractised in the Nuxalk way. Tallio and others are working to bring Nuxalk rights back to this place and many more throughout Nuxalk territory. In the coming years, many places in the Nuxalk homeland, roughly from Dean Channel in the north to South Bentinck Arm in the south and King Island in the west to the Bella Coola Valley in the east, may come under Nuxalk jurisdiction for the first time in more than a century. 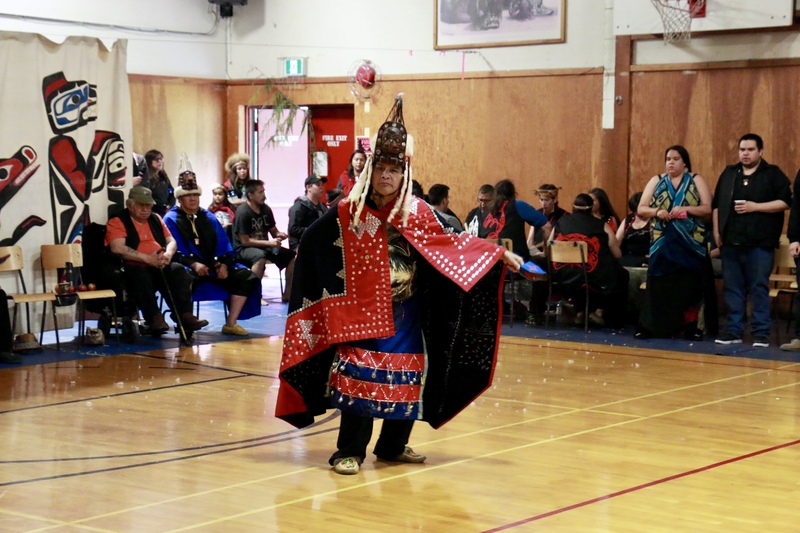 The night I arrive in Bella Coola, the Moody family hosts a potlatch, a Nuxalk celebration of singing, dancing and gift-giving, to pass their hereditary title, Nusmata — meaning “Heaven” — from Larry Moody Sr. to his son Larry Jr. In 2015, the elder Moody hit the $1 million jackpot in Lotto 6/49. He used the winnings to buy cars for his brothers, furniture for his home and a Harley for his son. A year later, he suffered a brain aneurism. The 77-year-old’s health has been declining, so he’s decided to pass the mantle of leadership to his son. In the Nuxalk Hall, a community gymnasium that doubles as a big house, the Moody family treats some 200 Nuxalk and visitors to a feast. From my seat atop the wooden bleachers, I watch elders visiting with old friends and kids chasing each other in endless games of tag. With guidance from Tallio and other Nuxalk culture keepers, the Moody family makes ready for the potlatch, hanging cedar boughs over the entrances to ward off spirits. Behind a screen painted with Nuxalk designs, Larry Jr. dons his father’s finest traditional regalia and prepares to take on his new name. In the re-emergent Nuxalk ancestral governance system, this hereditary title will give Larry Jr. a role akin to a borough president in New York City. Nusmata can make land use decisions for Snut’li, his family’s traditional village site in the Bella Coola Valley, but like those big city borough presidents, Nusmata is more advisor than policy-maker in community-wide decisions (decision-making authority on reserve still rests with the elected band council). As the Nuxalk look to re-assert sovereignty over their territory, which encompasses dozens of ancient family seats abandoned during the colonization and settlement of this land, men like Larry Jr. will become increasingly powerful and important in the governance of the Nuxalk people and their places. As we polish off our plates of beef stew with mashed potatoes, Noel Pootlass, who holds the title Nuximlayc, head hereditary chief representing the village of Q’umk’uts, site of the present-day reserve, takes the floor in a regal sea lion-whisker headdress plated with ermine pelts and a red-trimmed button-blanket embroidered with an eagle crest. All stand as he dances his song, right hand placed proudly on his hip, rattle shaking in his left. He presides over the dance floor, turning from left to right, chin high, taking in his people and domain. The Nuximlayc name almost did not survive. In 1975, the last Nuxalk elders who still remembered the hereditary laws sent for Noel’s father Lawrence, who was working as a janitor in the Empress Hotel and the provincial legislature in Victoria at the time. But at first, Lawrence did not want to be chief and was reluctant to return. His parents were deceased. He was a residential school survivor sent far away to Port Alberni as a child, his language and culture beaten out of him by priests who believed them to be the devil’s work. As a young man, he struggled with alcoholism and attempted suicide. By the time the elders found him, he had children, including Noel. The reserve is a hard place to raise a family. Lawrence was poor. He did not know that the abundance of the Bella Coola Valley—the huckleberries and medicines and treasured songs and dances—were his inheritance. He did not know that he was much more than a janitor; that he was descended from leaders. It took some convincing, but eventually he returned to dress and dance his name, Nuximlayc. The reserve is a hard place to raise a family. Lawrence was poor. He did not know that the abundance of the Bella Coola Valley—the huckleberries and medicines and treasured songs and dances—were his inheritance. Lawrence is revered as a great leader to this day. In 1995 he helped lead a reoccupation of Ista, a Nuxalk borough and sacred place on King Island where the first woman is said to have descended to this world. The protesters built a traditional smokehouse in the middle of a logging road to prevent clear-cutting on the island. Some were jailed for up to 28 days for their actions. The reoccupation became international news. Lawrence also worked to repatriate Nuxalk artifacts from museum collections around the world. He built alliances with Nuxalk neighbors like the Kwakwak’wakw and Heiltsuk through a series of peacemaking potlatches. And in 2011, at the last of these celebrations, he passed his title to Noel. The following year, at the age of 79, he died. Noel suffers from nerve damage. The weight of his body—and perhaps his past—makes his knees quiver. In his cluttered rez home, he moves gingerly up and down the stairs from living room couch to basement studio. Debilitating pain almost prevented him from dancing at the potlatch. But tonight, Noel is feeling it. Grooving in his chief’s regalia to his chief’s song, he moves with the pride of his history. When the song finishes—a long one at seven minutes—he cheekily yells: “One more!” to uproarious laughter. When he is done, the floor is blessed and the Moody family can share their own box of treasures—the songs and dances they hold rights to. They bring out the raven, who hops, pecks and bobs about the floor, looking for trouble; the haughty eagle who struts to the centre of the hall, tossing his head left and right like he owns the place; the wolf—a new tradition from afar—who has copper eyes and a blue snout. He howls as he saunters by. There’s the hummingbird, with a round blue face and grey outstretched wings; the grizzly bear, who lumbers with surprising grace across the floor, shoulders swaying, before dancing up onto her hind legs; the copycats, who weave in and out in ridiculous outfits, making a ruckus and reminding us not to take ourselves too seriously. Tallio narrates the story of every treasure as the masked dancers move out onto the floor. Finally, at the end of the night, we all join in a Friendship Dance, a tradition from the neighboring Haisla. The boy-band-esque words to the song, according to Tallio’s translation, are: “If you leave me, I’m going to go out of my mind.” As the dance ends, all in attendance raise their hands aloft in a customary sign of respect and thanks. When the floor is cleared of beaming Nuxalk, the Moody family piles gifts into a large mound at the center of the hall. All leave with full bellies and baskets of goods. By accepting the Moody family’s offerings, we, the attendees, show that we accept the transfer of the Nusmata name from senior to junior. For tonight, at least, the work of carrying forward Nuxalk rights and traditions is done. The next day, the whole valley has a potlatch hangover. At the Nuxalk band office I meet Wally Webber, Chief Councillor of the Nuxalk, whose grey shoulder-length hair and plain black-rimmed spectacles make him look like an aging hipster. Webber heads the Nuxalk elected government responsible for policy and welfare on the reserve. He also holds the hereditary title Snxiluulhla, a name that hails from “Sunny Village,” the land the band office stands on today. We are joined by Ernie Tallio, the stout and soft-spoken manager of the Guardian Watchmen, a Nuxalk environmental stewardship program. We pile into his white GMC pickup and ride down to the wharf. At the docks, Blair Hans, 21 and Keith Windsor, 37, dressed in khaki Watchmen uniforms, are preparing their vessel, a brand-spanking-new boat custom-built in Oregon last year. Clyde Tallio, worn out from last night’s duties, is there too. Hans is in his first season as a Watchman and has been on the receiving end of his fair share of pranks. One of his first days on the job, the Watchmen told Hans to “calibrate” the boat’s radar by sprinting back and forth on the dock, holding an antenna above his head. “Faster! Faster! It’s not working, faster!” they yelled, until they couldn’t control their laughter and Hans was sweaty and red with embarrassment. Windsor has made his living out on the water since he was a young teen helping to run his grandfather’s gillnetter. For the greater part of two decades, he operated a pusher boat called the Vanishing Breed, fishing up and down the Pacific coast from Vancouver to Ketchikan, Alaska. But the industry has slowed in recent years. Fishermen have to travel further and further out to sea to net their catch—spending more time away from home while eking out a living on thin margins. Windsor stopped working in the commercial fishery five years ago to spend more time with his family. Two years ago, Ernie Tallio hired him as a Watchman. He recently completed training at Vancouver Island University and is now one of six employees in the program. From April to October, Ernie Tallio, Hans, Windsor and the Watchmen patrol the labyrinth of inlets, islands and fjords that comprise the Nuxalk homeland. The program provides secure jobs to Indigenous people in a region with few, but it offers more than just employment. As eyes and ears watching over water and land, the Watchmen are enacting a simple but potentially revolutionary principle: the return of territories and resources to Indigenous protection. The Nuxalk program, established in 2010, was inspired by the pathbreaking Haida Watchmen initiative formalized in 1981. Today, Guardian programs draw on the Haida model, the Indigenous Rangers program piloted in Australia in 2007, and a growing network of similar initiatives across Canada. The Indigenous Guardians Toolkit, developed by Nature United in conjunction with Indigenous partners, counts more than 45 communities conducting Guardian activities across Canada. The 2017 federal budget includes $25 million over five years to fund more pilots. As eyes and ears watching over water and land, the Watchmen are enacting a simple but potentially revolutionary principle: the return of territories and resources to Indigenous protection. Under the wispy morning fog, the Guardian Watchmen, Wally Webber, Clyde Tallio and I set out onto the choppy waters of North Bentinck Arm. As we travel, Clyde Tallio narrates the Nuxalk history and place names of his territory. Below us, on the seafloor of the ocean-flooded valley of North Bentinck, lies the house of the chief of the undersea world, Q’umakwa, whose name we do not say out on the water. While Clyde tracks our patrol through linguistic history, Ernie uses an app on his standard issue Guardian Watchmen tablet to collect data. Last year, the Nuxalk Guardian Watchmen traversed 14,723 kilometres of territory on 139 patrols. They are well on their way to exceeding that number this year. The data they collect is uploaded to the cloud where First Nations policy-makers combine it with science, analytics and traditional Indigenous governance systems. Indigenous governance and environmental science often advance in tandem. The Nuxalk Guardian Watchmen recently wrapped up a bear study that helped advance knowledge about bear behaviors and populations in their territory. The Watchmen are often the only authorities out on the land. They rarely encounter BC Parks or Fisheries and Oceans Canada rangers because those understaffed agencies can’t afford regular patrols. As a more constant and reliable presence, the Watchmen are increasingly called upon to uphold not just Indigenous and environmental laws, but also public safety. Just three days earlier, the Nuxalk Watchmen rescued three teens who capsized their kayaks near the mouth of the Bella Coola River. Later in the season, the Watchmen encounter sport fishers, wildlife viewers, commercial trawlers and professional prawners. They give the visitors they meet a friendly reminder that this is Nuxalk territory and ask that all respect the Nuxalk way. Through their actions, the Guardian Watchmen are steadily building a case for Indigenous governance of this coast. And among the public, the Guardian Watchmen are gaining favour with fishermen, tourists and locals they encounter on patrol every day. As we near the end of Ats’aaxlh, or South Bentinck Arm, where the Taleomy and Noeick rivers converge into the inlet at Taleomy Narrows, we approach the ancient village of Talyu, the home of Clyde and Ernie’s Tallio ancestors, the Talyuumc “Descendants of the Queen of the Undersea,” as well as the Hans and Snow lineages. An Indian agent evicted the last of the Snow family, who maintain the hereditary title of Snuxyaltwa, “The Light of the Universe,” in the 1930s. He threatened to take the children and prosecute the parents if the family did not relocate to Bella Coola. Loggers burned what remained of the village not long after. Interfor, a logging corporation, clear-cut this part of South Bentinck Arm in the 2000s. We board a dinghy to make the final jaunt to shore. In a clearing at the edge of the forest, a massive totem pole rises amid the trees. As the Nuxalk reassert rights to their homelands, they have erected poles like this one — traditionally used as grave and boundary markers — throughout their territory. In 2009, the Snow family hosted a potlatch to raise this pole, carved by Harry Schooner and his assistants, to reassert rights to this place. The pole tells the Snuxyaltwa Smayusta, or origin story, depicting the loon, the whale, the grizzly, the thunderbird, the sun and the angel Yulm, the eldest of the four mythic Nuxalk carpenters who helped Creator make the world. We gather around the pole, peering up at its intricate carved and painted black, blue and red designs. Windsor runs his hand over a fresh gash on Yulm’s belly where a grizzly has marked its own claims, reminding us that this is also bear country. We linger awhile. Clyde takes a seat at the base of the Snuxyaltwa pole and lights a cigarette. He bows his head, looking down between his feet at the muddy turf of his ancestors’ home and exhales. That evening in Bella Coola, Nuximlayc brings me along to a Nuxalk elders council meeting, held in a double-wide trailer down the street from the Nuxalk Hall. At the front of the room, Bernie Elkins, a square-jawed and confident man who serves as the Nuxalk stewardship director, is giving a presentation about ongoing land rights issues faced by the Nuxalk and potential ways to address them. Elkins has deep experience in this area. In the early 2000s, he worked as a negotiator for the Northern Secwepemc, which includes my own community of Tsq’escen, as we brokered our own modern treaty with the province. From 2008 to 2016, Elkins served as the elected chief of the ?Esdilagh (Alexandria) Tsilqhot’in. During Elkins’ tenure in 2014, the Tsilqhot’in Nation won a landmark Supreme Court case affirming rights and title to their traditional territory. The risks are many, as are the possible ways forward for Elkins and the Nuxalk. They could pursue a treaty like the Northern Secwepemc—a possibility they’ve already written off as selling out because it would require the Nuxalk to forfeit their claim to vast swaths of land. They could litigate like the Tsilqhot’in—an appealing option because they could regain a large allotment of land and open the door for other First Nations to do the same. But this is likely the most expensive path, entailing years of legal fees as they work towards a ruling—and victory is far from certain. They could negotiate with federal and provincial governments, creating a single agreement for their entire territory or resolving each dispute piecemeal. Or they could take direct action to protect land and demonstrate resolve, like their forefathers at Ista, pushing the issue in the press and forcing decision-makers to pick a side in their long struggle to reclaim rights. The Nuxalk want to build a big house in the Bella Coola Valley and are planning a grand opening for 2020 but have yet to secure a site. A good portion of tonight’s meeting focuses on that issue. Not all agree with Snow’s position. Elkins seems hesitant to endorse more confrontational tactics and worries that the Nuxalk could get hit with an expensive lawsuit if they opt to go that way. Sure, they might win, but they could also use the money they would spend fighting that case to resolve other land rights issues. This is the complex political dance the Nuxalk must tread: a constant community-wide process of debate, negotiation and ceremony to reposition the Indigenous as a governing authority in the eyes of outsiders. All present in the meeting agree that the future of this land, water and air will be Nuxalk. But how exactly Nuxalk rights will be resurrected in the decades to come remains uncertain. For now, Elkins and more moderate voices seem to hold sway. But from tonight’s conversation, I get the sense that could change. Beyond the tl’msta figure stand carvings representing the spirits of the next world, or syut. The syut are like a cross between patron saints and platonic forms. They care for particular parts of the world — the mountain, the forest, the trees, the rocks — but they also epitomize emotions and ideals like anger, laughter, medicine and the hunt. Nuxalk spiritual leaders came to this place to learn their dances. “As you go through their story and understand them and learn to connect and dance with these beings, you’re able to learn more about yourself and what it means to be human,” Tallio explains. These rocks inscribed with epistemologies that have endured across millennia gesture at something more permanent than paper edicts, digital currencies and national governments, connecting Tallio and me to the hands and truths of the First Peoples of this place: another way of being, another potential. Tallio and the Nuxalk are set on carrying this, the imperative of their history, their roots and their people forward. There will be tension, undoubtedly, as residents of the Bella Coola Valley and decision-makers in Victoria and Ottawa reckon with these resurgent Nuxalk, their renewed authority, their hereditary leadership and their Guardian Watchmen. But there will be cooperation, too. Three weeks after I depart Nuxalk territory, Prime Minister Justin Trudeau traveled to Prince Rupert, a port town north of Bella Coola, to sign a reconciliation agreement with 14 coastal First Nations, including the Nuxalk, promoting collaboration in the management and protection of the coastal ecosystem. Climate change, igniting boreal forests, melting mountaintop glaciers, warming North Pacific waters and shifting political currents will undoubtedly complicate this unfolding story. But whether this new geological age marks a catastrophe, a beginning or both is not yet written in stone. At the crest of the trail, the threshold where we greet carvings depicting the spirits of the next world, there is a bowl worn into the rocks and marked with the four directions, where visitors can pray and ask for blessings. Tallio and I touch the water in the bowl, asking for blessings as we step out into the uncertainty of the next world that lies beyond. Someday, maybe, the Nuxalk will dance the stories of these ancestors, the ones who survived the catastrophe of colonization and navigated the turbulent waters of self-determination and reconciliation to restore their way of being to this world and this place. Julian Brave NoiseCat (@jnoisecat) is a contributing editor to Canadian Geographic. He is a member of the Canim Lake Band Tsq’escen in British Columbia.